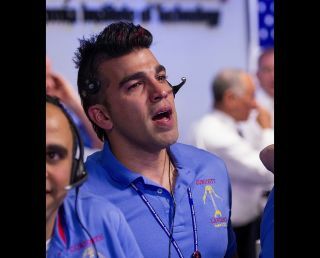 Mars Science Laboratory systems engineer Bobak Ferdowsi at the Jet Propulsion Laboratory in Pasadena, California, reacts after the Curiosity rover landed on Mars on Aug. 5, 2012 (PDT; Aug. 6 EDT). Plans to visit Europa, Jupiter's icy moon with a subsurface ocean, just became a bit more concrete. Scientists think the planet is one of the top places in the solar system that could support alien life. This month, the White House released its fiscal year 2016 budget request for NASA, which included $30 million for a mission to Europa. If funded, the mission would likely be something akin to the Europa Clipper, a proposed spacecraft that would make a number of flybys of the mysterious moon, probing its icy shell and subsurface ocean. Space.com caught up with Ferdowsi last September at the science and sci-fi convention HawaiiCon, on Hawaii's Big Island, to discuss the proposed Europa mission, what it was like working on Curiosity, and life as an instant celebrity. The following Q&A has been edited for length and clarity. Bobak Ferdowsi: Like Mars, Europa has been a part of our lore of space for a long time. "2010: Odyssey Two," science fiction author Arthur C. Clarke's 1982 sequel to "2001: A Space Odyssey," famously warned: "All these worlds are yours except Europa: Attempt no landings there." Luckily, Clarke later gave NASA "permission," during a teleconference, to visit the planet. We believe Europa's crust has a large, salty ocean underneath. It has the ingredients for life ­– water, warmth and chemicals from the core, like we see on Earth. We think Europa's ocean has probably persisted for a long enough time for life to arise. Europa is like one of those bucket-list places. Who doesn't want to go in a submarine under the surface and look for creatures like whales? Space.com: What would a Europa mission involve? Would it be like the film "Europa Report?" Ferdowsi: We were assigned money from Congress for a Europa study. At JPL, we envision a mission consisting of a series of flybys, in which a spacecraft will swoop by the planet for a couple hours at a time, in a highly elliptical orbit lasting roughly two weeks. Jupiter has a strong magnetic field whose radiation could wreak havoc on electronics if it spent more time near the planet. The spacecraft would slowly move its orbit around in order to capture Europa from all sides. The flybys would be reconnaissance for a future mission when we might land on this moon. The potential launch date would be 2022 [current estimates put the date in the mid-2020s]. We could be there 2.5 to seven years later. We're going through the mission concept review, and we're hoping to get selected in the next year or so. I'm very optimistic that NASA as a whole is going to do some sort of Europa mission. Space.com: You also worked as a mission planner on the Curiosity mission. What was it like during those "seven minutes of terror"? During the landing, controllers on Earth couldn't lock onto a signal from the spacecraft, so we could only communicate with it in one of two ways. The spacecraft sent back pings, or "notes," which told you what the spacecraft last did, what it was about to do, and so on. And some of the time, the craft was also talking to Mars orbiters, which could relay information to us. The landing itself was a really weird sort of stress, because of the light delay between Mars and Earth (Mars is 14 minutes away). Even when you're just about to start this crazy landing, it's already been done for seven minutes. Whatever the result is, it's over. And so many things were one-time-only: The parachute had to deploy, incendiary bolts called pyros had to fire and cut away parts of the spacecraft, the sky crane had to lower us to the ground. It's kind of crazy when you think about all the things that had to happen. Space.com: Let's talk about your mohawk. Ferdowsi: My hair was a tradition for the big efforts during the mission. For system tests, I started shaving the number of the test on the side of my head. For launch day, I did a very brightly colored haircut that looked like a rocket flame, fading from red to gold. I think the team knew I was going to do something for the landing. My boss sent out an email asking what my hair should look like, for example, "Mars red," red, white and blue, even a reverse mohawk (which I definitely did not want to do). The favorite was red, white and blue. Space.com: What was it like to become an instant celebrity? Nobody gets into engineering or science thinking, I'm going to be famous. But I think the nerd stereotype is changing. It's been a long time since the public saw a NASA control room. I grew up wanting to be a part of the space program at NASA and JPL. To have the opportunity to represent the family I love so much and to be able to talk to people and share the excitement is really an honor. The best part for me is getting to talk to high school kids who are interested in NASA about how much fun it is when that many people come together with a singular focus, to build a roving science laboratory on Mars. NASA may be American, but the effort was very international. Landing on Mars felt like a very human moment to me. Follow Tanya Lewis on Twitter. Follow us @Spacedotcom, Facebook and Google+. Original article on Space.com.